Not to be confused with Ohio State University or University System of Ohio. 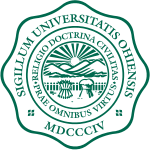 Ohio University is a major public research university in Athens, Ohio, United States. One of America's oldest universities, its charter was proposed in 1787, and approved in 1804, and opened for students in 1809. As of 2014, the Athens campus had 23,300 students; the other five campuses had approximately 10,000, and eLearning 5,900. The university maintains a selective admission rate with further admission requirements for its schools. The Heritage College of Medicine maintains its separate select admissions criteria. Ohio University offers more than 250 areas of undergraduate study. On the graduate level, the university grants master's degrees in many of its major academic divisions, and doctoral degrees in selected departments. Ohio University is fully accredited by the North Central Association of Colleges and Schools. The Carnegie Foundation for the Advancement of Teaching classifies Ohio as a Research University (high research activity) under the Basic Classification category. Ohio's athletic teams are called the Bobcats and compete in the National Collegiate Athletic Association (NCAA) at the Division I level as charter members of the Mid-American Conference. Ohio football has participated in nine bowl games through the 2015 season, while the men's basketball team has made 13 appearances in the NCAA Men's Division I Basketball Championship. 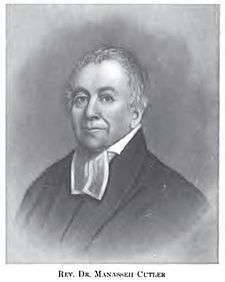 The university was appropriated and envisioned by Manasseh Cutler, credited as the school's founder along with Rufus Putnam. 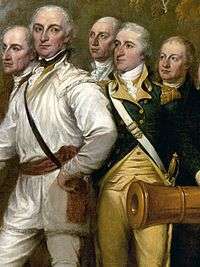 Cutler had served as a chaplain in Washington's Continental Army. The institution's first name was American University. [1 1] President Thomas Jefferson's policy initiatives included a westward expansion of the new nation, with the addition of several territories to U.S. statehood. In 1797, people from the first settlement of Marietta traveled upstream via the Hocking River to establish a location for the school, founding Athens due to its location directly between the original capital of Chillicothe and Marietta. In 1802 approval was granted by the territorial government for the establishment of the American Western University, but that school was not operated under that name. 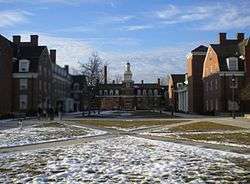 Ohio University was formally established on February 18, 1804, as its charter was certified by the General Assembly of the new state. Its establishment came 11 months after Ohio was admitted to the Union. The first three students enrolled in 1809. The university graduated two students with bachelor's degrees in 1815. The university was not gifted by the stalwart Republicans with lands and monies for the agricultural and manufacturing colleges as part of the Morrill Act of 1862. The 20th century brought unprecedented growth in student enrollment, academic offerings, and research facilities. Between 1955 and 1970, the university realized a tripling of undergraduate enrollment (from 7,000 to 20,000) in the post-World War II expansion of college education. University Presidents Baker and Alden served as the catalysts for such dramatic changes. During this era, the university's campus tripled in size, with the construction of 25 new dormitories located on two new residential college greens, radio and television stations, new research and classroom facilities, and the construction of a major 13,000-seat sports arena (Convocation Center). In 1964, U.S. President Johnson publicly referenced his Great Society initiative for the first time on the College Green, bringing Ohio U into homes across America and garnering news in all continents. Nearly a half century later, President Obama addressed a large university crowd, at the same location, in October 2013. In 1975, Ohio established its medical school, known as the Ohio University Heritage College of Medicine. Heritage is the only medical college in the state to award the D.O. degree. In 2011, the college received the largest private donation ever to be given to a medical college in the U.S. Ohio was classified Tier 1 University by U.S. News ranking of "Best American Colleges" at that time, and named by the Carnegie Foundation for the Advancement of Teaching as a Doctoral/High Research Activity institution to reflect its growing number of graduate programs. Ohio's libraries contain more than 3 million bound volumes. Ohio's main campus is located in Athens on the Hocking River. Constructed while President Thomas Jefferson was in office, New England and Early Americana Federalist themes are prevalent in the university's earliest architecture. Development of the campus began in 1812 with the erection of the university's central building, Manasseh Cutler Hall, a designated and registered national landmark, and built only 20 years after the White House's construction. The original architectural style is evident in the campus' oldest buildings located around the College Green, and reflected throughout the entire storybook campus. Sometimes cited informally as a 'public ivy' and one of the most beautiful residential campuses in America, the university has also adopted modern elements into its campus without displacing these early American period structures. The historic climate of campus and its early colonial roots prompted Time Magazine to describe the university as "Harvard on the Hocking", a reference which has grown in popularity over the years. The historic College Green is the central quadrangle lawn and location of significant campus buildings: Manasseh Cutler Hall, the Office of the President; Wilson Hall, the College of Arts and Sciences; McGuffey Hall, named for William McGuffey; and the College Gateway. These three original primary structures are featured elements of the official current university logo and maintain true to their original design of over 200 years ago. The College Green has changed little in the past two centuries, which contributes to the university's colonial appearance, call me. The green, inspired by the university founders, is based upon the classic layout of traditional English and New England towns and similar to university quadrangles. The College Green features Galbreath Chapel, the spire of which topped with a brass weather vane, is modeled after that of the portico of Nash's All Souls Church in London. Other buildings on the College Green include Chubb Hall, home to Undergraduate Admissions as well as the Offices of the Bursar and Registrar; Ellis Hall, home to the departments of English, Classics and World Religions, and Philosophy; Templeton-Blackburn Memorial Auditorium; as well as Bryan Hall, an upperclassman residence hall. The College Green is framed by two main university gateways. Alumni Gateway, built in 1915, features verses well-known to the university community which may be read upon entering and leaving campus. The words over the gateway are borrowed from the Latin phrase inscribed over a gateway to the University of Padua, Italy, and was dedicated at the beginning of the 20th century upon the 100th anniversary of the university's first graduating class. The newer College Gate, built in the 1960s, features words taken from the Northwest Ordinance of 1787 regarding public education and its founding as one of America's first public universities. The bronze university seal, embedded at the college gate, maintains the tradition that freshman must avoid stepping upon it or risk bad fortune. The nearby chimes from the Cutler bell-tower's cupola ring out on the hour and sound the university Alma Mater at noon, which can be heard throughout the surrounding town and valley, as they have since 1820. The city of Athens, well integrated with the university, has remained adaptive to the original architecture of the community, and is well known for its streets made of red Athens Brick which augment those found on campus. There are two residence halls on the College Green. The John Calhoun Baker University Center, which opened in January 2007, is named after John Calhoun Baker, the 14th President of Ohio. The facility replaced the original Baker Center located on East Union Street across from College Green and serves as the hub of campus activity. The $65 million student center is operated by the Division of Student Affairs and serves students, faculty, administrators, visitors and Athens community members. Electronic maps and virtual university e-tours, available at center information desks and online, direct visitors across campus. The five-story facility has been praised by The Association of College Unions International for its extraordinary visual appeal and blending with the campus' historic overall classic theme. The building features Federal architecture, subtle stonework, and large windows that admit a great deal of natural light and afford expansive views of campus. In contrast to the exterior's red brick and white columns, the interior has a more contemporary style with high domed ceilings, ergonomic furniture and a color scheme of sage, plum and mocha. Terrazzo mosaics of aspects of the earth's globe are embedded in the Grand Atrium of the main entrance to the building, which features an elegant rotunda with curved walls, wood monumental staircase and large free-form chandelier which illuminates it. An unusual acoustical quality of the building is the fact that any individual standing at the exact center of the inlaid arrow on the floor of the entering rotunda and facing its entrance, speaking or even whispering amongst the parabolic shaped walls, produces a unique reverberating echo similar to the effect created at the center of the United States Capitol Rotunda in Washington, D.C. Another unique feature is the fountain escalator system, the only escalator in southeast Ohio, intersecting the huge atrium and connecting College Green and West Green. An outdoor second floor, featuring terraced patio dining, presides over a picturesque natural pond as well as a partial view of Peden Stadium and Byrd Arena. Baker Center also contains a large food court called West 82; a fine dining restaurant called Latitude 39; a Grand Ballroom; The Honors Collegium, The Wall of Presidents, the Bobcat Student Lounge, a shop called Bobcat Depot that sells apparel, computers, and accessories; a theater seating 400; study areas; computer labs; administrative offices; and numerous conference rooms. The Front Room, a large coffee house named after a former popular university rathskeller, features a stage, artwork and a community fireplace. It serves Starbucks products and university bakery items and is housed on the fourth floor, which opens onto its own outside terrace as well as onto the intersection of Park Place and Court Streets, making it a hot spot for students between classes. Other amenities include a United States Post Office and the Trisolini Art Gallery, named after a prominent Italian-American fine arts faculty member. Vernon R. Alden Library serves the Athens campus as the central library facility and seats 3,000 people. The collection of the Ohio library contains over 2.3 million units of microfilm material, 13,500 periodical subscriptions and 3 million printed volumes, making it one of the 100 largest libraries in the United States. The university maintains a complex system of archives in its libraries. A university archives center displays books and collections important to the university's two century history; along with a rare original hand scripted Bible. The Learning Commons, located on the building's second floor, is open 24 hours, 5 days a week allowing students to meet and use parts of the facility. Laptops and other accessories are available through technology services at the reference desk. The library is organized by the Library of Congress system and no longer by the Dewey Decimal system. Outside Alden Library and directly behind Cutler Hall is Wolfe Garden, a small outside enclave in the shape of the State of Ohio, and features native Ohio trees and plants, providing a contemplative respite for reading and thinking. The oldest green, there are twelve residence halls on East Green. This area of the university includes three of the steepest walkways at the hilly Athens campus: Morton Hill, the Bryan Hall terrace and staircase, and Jefferson Hill. Each walkway is well-lit, and affords East Green residents easy access to classrooms if they are willing to walk or bicycle. The East Green's Scott Quad, as lore maintains, is a residence hall that provides for a successful relationship to those who kiss beneath its gateway arch. Peden Stadium, the University's football field and the oldest football venue in the Mid-American conference, adjacent to a new multipurpose indoor training facility, Walter Fieldhouse. It is a designated Official Ohio Historical Site. Bird Arena, home of the Ohio University Hockey Program. Ohio University Aquatic Center, home to the university's swimming and diving teams. The Charles J. Ping Center is one of the largest recreational facilities in the nation. Covering 168,000 square feet (15,600 m2) on three floors, Ping houses a 36-foot (11 m), double-sided climbing wall, five basketball/volleyball courts, two multipurpose gymnasiums, an elevated four-lane indoor running track, eight racquetball courts and an enclosed glass fitness area. Ping Center also provides free weight and cardio rooms, aerobics and fitness classes, combative sports, dance, meeting rooms and personal training. The recreation center also houses club sports and intramural sports. Construction began in 1994 and it opened in January 1996. Ping was named in honor of the 18th president of Ohio University, Charles J. Ping. Ping is also one of the largest student employers on campus, allowing for the facility to be one of the few campus rec centers that is almost solely student run. West Green includes buildings around the western part of the Athens campus. The Ohio Athletic Mall spans the western portion of the campus, near the end of the Athens bike path at the Union street crossing. The mall features lacrosse, baseball, track, field and related athletic venues. Along the surrounding the Hocking River, are a series of sakura trees planted to commemorate the university's historic partnership with Chubu University. Japanese Students sponsor an annual "Sakura Festival" each year, a cultural event celebrating the visually dramatic blossoming of the cherry trees and their evening lightings. Anchoring West Green quadrangle is the Stocker Center, which houses Russ College of Engineering. Academic and Research Center, the largest research center of its kind in Ohio. Ohio Softball Field, home to the university's softball team. Goldsberry Track, home to the university's track and field teams. Bob Wren Stadium, home to university's baseball team. Chessa Field, home to the university's women's soccer program. Pruitt Field, home to the university's women's field hockey team. The Ridges, a former Athens hospital acquired by the university. The Victorian styled area has since been re-purposed as a university complex of classrooms and administrative offices surrounded by a large nature preserve. Gordon K. Bush Airport, an off-campus airport owned by the university. The Athena Cinema an off-campus, century-old movie theater owned by the university. Ohio has been cited for academic quality and value by publications Fortune, U.S. News and World Report, BusinessWeek, Forbes, America's 100 Best College Buys, Princeton Review's Best Colleges, and Peterson's Guide to Competitive Colleges. The John Templeton Foundation has also recognized Ohio University as one of the top character-building institutions in the country. The Chronicle of Higher Education has recognized the university as one of the top producers of U.S. Fulbright scholars by type of institution, with the highest number of recipients in the state as well as the Mid-American Conference in 2011-12. Its total number of Fulbright winners frequently ranks the university first in the state and places the university in the company of Boston College, Princeton University, and UCLA. Ohio University was recognized by the U.S. Department of State's Bureau of Educational and Cultural Affairs as a top producer of 2014-2015 Fulbright U.S. Students. Ohio pursues an enrollment process with selective admissions criteria, and a current admission rate of 69% of applicants. Total surveyed student demographic: African-Americans account for 5%; (1,061); Asian Americans 1.3% (270); Caucasians 84.6% (17,926); Hispanic 1.9% (411); International 6.8% (1,437); and Native American and American Indian 0.4% (77). The university honor code includes the traditional pillars of character, citizenship, civility, commitment, and community. Freshman formally enter the university with their annual convocation and march beneath Alumni Gateway along with university officials. The university has been recognized for its student success rate in garnering nationally competitive awards. In the 2010 to 2011 year, Ohio students received a total of 70 nationally and internationally competitive awards. Some significant honors received by Ohio students in recent years include Fulbright Awards, the Marshall Scholarship, the Mitchell Scholarship, the Truman Scholarship, the Udall Scholarship, the Goldwater Scholarship, and the Hollings Scholarship. In 2006, twelve Ohio students received Fulbright scholarships. In both 2004 and 2005, Ohio University had nine Fulbright Scholars, besting the university's previous record of six awards. The total university student enrollment is in excess of 39,000, encompassing its main campus in Athens and regional campuses. Students are organized into several colleges according to their interests. The academic organization of students includes the following areas of specialization. The College of Arts and Sciences continues to provide the first degrees offered by the university, the B.A. and B.S., and is the largest college on the Athens campus with 18 departments and a variety of interdisciplinary programs, research centers, and institutes. The foundational instruction for the university, delivered through the general education and liberal arts curriculum, is centered in its departments. The college provides the primary instruction for approximately one-third of the majors on campus. At the graduate level, the college offers a variety of masters programs, and eight departments offer doctoral degrees. A range of scholarly pursuits, funded research projects, and creative activities are undertaken by the college's students, staff, and faculty. Incoming students with an ACT of 25 or higher may apply for The Scholars Program in Arts and Sciences. This integrated learning experience allows selected first-year scholars a jump-start towards their academic goals by offering an intensive year-long interaction with highly regarded faculty. Juniors or seniors who maintain at least a 3.5 GPA may be eligible to graduate with "departmental honors." The opportunity to create a research project and/or write a thesis is provided by many departments in the College of Arts and Sciences for highly motivated students. Some students elect to finish two majors or two degrees for optimum use of their undergraduate years, while others add value by completing a minor and/or certificate program from the many offered. A full language curriculum features programs in Spanish, French, Russian, Italian, German, Latin and Swahili. The College of Business was established in 1927. It offers nine different majors and a general business minor for students with non-business majors. Following University-wide restructuring in 2010, it includes the Department of Sports Administration, which offers students an undergraduate degree in Sport Management and three graduate programs. Despite University measures to increase enrollment, the college is smaller than other national business schools, and all business classes are taught by professors instead of graduate students. The college also offers an MBA program for Indian students in Christ University Bangalore. The college requires students take four classes in a 'cluster' format, or simultaneous sequencing. In the cluster, students are teamed up and complete research projects. The students then receive a grade in all four of their classes on the project. This program is an opportunity for students of different majors to interact and is considered a good illustration of how situations are often structured in the business world. The School of Accountancy is nationally recognized. The school promotes the Business Activity Model in its intermediate classes that has proven beneficial. Designed to mimic the experiences of an auditor, accounting students often credit the model with preparing them for internships. One of the authors of business activity model, Connie Esmond-Kiger, was named Director of the School of Accountancy in 2007. She is also the adviser for Ohio's chapter of Beta Alpha Psi, the financial majors fraternity. Ohio's chapter maintains Superior status and has won national awards. The Schey Sales Centre was initiated in 1997 by the Ohio Board of Trustees and offers a professional sales certificate to students. This certificate is open to any Ohio student, and requires students to complete 28 credit hours of sales classes as well as complete a 300-hour sales internship. Three entities oversee the program: the Professional Sales Advisory Board (PSAB), which is composed of sales professionals who give back to the program with money or advice on the industry changes; the support staff, which includes professors at Ohio University who advise the students in the program; and lastly, a group of students who run the program and they are referred to as The Candidate Advisory Council, which was created in 2004. The centre hosts a sales symposium each spring quarter where professional speakers address market changes, sales strategies and profit. Additionally, sales students took home first place at the National Collegiate Sales Competition in 2009. There are 16 active student organizations functioning within the college. Chapters of three national business fraternities, the Christian Business Leadership organization, and societies or fraternities for almost every major mark these. Copeland Hall, seat of the college, maintains six computer labs and two study lounges with computers, as well as many conference rooms and small group rooms. The college's Student Equity Management Group, started in 2003, uses $3.3 million from the university to invest. Unlike many other schools, Ohio's group is open to all undergraduate students and is completely student run. The group's portfolio has increased by 51.29%, since its inception, beating the S&P 500 by 42.61%. The Candidate Advisory Council is a student-centered organization is run by the students and entirely self-funded. They pay for their classes, professors, events and resources. The university does not assist with any of the financial responsibility. Money is collected from companies who invest in the program solely to recruit the 200+ students working towards a sales certificate. 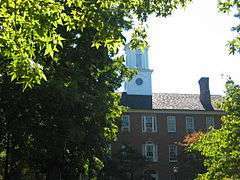 Ohio University Scripps College of Communication comprises five schools and one research lab (see 'Research Centers'): The E.W. Scripps School of Journalism, the J. W. McClure School of Information and Telecommunication Systems, the School of Communication Studies, the School of Media Arts and Studies (formerly the School of Telecommunications), the School of Visual Communication, and the Game Research and Immersive Design (GRID) Lab. The E.W. Scripps School of Journalism, known colloquially as the J-School or simply Scripps, is recognized as one of the world's premier journalism schools. Undergraduates select from two academic tracks: News and Information, which includes coursework in broadcast news, magazine journalism, news writing and editing, and online journalism, and Strategic Communication, which includes coursework in advertising management, advocacy communication, and public relations. The School of Visual Communication, also known as VisCom, has been recognized twice as a Program of Excellence by the Ohio Board of Regents. The school offers students an interdisciplinary visual communication degree in one of four sequences: informational graphics and page design, photojournalism, commercial photography and interactive multimedia. VisCom is located on the third floor of Seigfred Hall. The College of Communications also houses Ohio's Speech and Debate Team, the Speaking Bobcats. In existence since the 1900s, the team has competed at every National Forensics Association National Tournament, most American Forensics Association National Individual Events Tournaments, and recently, have become prominent with the Novice National Tournament, Pi Kappa Delta National Conference and Pi Kappa Delta National Comprehensive Tournament. The team has been the top team in Ohio for five consecutive years, and has won two Novice National Tournaments in 2008 and 2011, one Pi Kappa Delta National Conference in 2009, two Pi Kappa National Comprehensive Tournaments in 2010 and 2012, and three NFA National Tournaments in 1971, 1974, and 1975, as well as multiple event championships at all National Tournaments, including several Individual Sweepstakes Championships. The Patton College of Education was established in 1959. 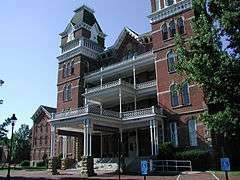 It has a history dating back to May 11, 1886, with the founding of a Normal Department at Ohio. The Normal Department – the predecessor to today's College of Education – was the first state-supported teacher preparation program in Ohio. The state's first kindergarten opened on the Ohio University campus in 1907. Today, the College of Education is organized into three departments: Counseling and Higher Education, Educational Studies, and Teacher Education. The college currently serves more than 2,100 undergraduate and 800 graduate students. On July 1, 2010, The Patton College became the home of several programs previously housed in the College of Health and Human Services, creating two new departments: Human and Consumer Science Education, and Recreation and Sport Pedagogy. Russ College of Engineering and Technology was established in 1920. The college is home to the university's highly ranked programs in the traditional fields of engineering at the undergraduate and graduate level. It enrolls approximately 1,400 undergraduates and almost 300 graduate students. It is named in honor of Dr. Fritz J. Russ, an alumnus in electrical engineering and the founder of Systems Research Laboratories, a major bioengineering concern. The Russ' left the college that bears their name approximately $91.8 million in real estate and securities, though details of how the money will be spent has yet to be determined. The College of Fine Arts was established in 1947. The college offers academic programs in art, dance, film, interdisciplinary arts, music, and theater. The university's marching band, The Ohio University Marching 110, nicknamed "The Most Exciting Band In The Land," is based out of the College of Fine Arts, and is currently under the direction of Dr. Richard Suk, Associate Director of Bands. The university's film program is located within the School of Dance, Film, and Theater in the College of Fine Arts. The Master of Fine Arts (M.F.A.) program is a professional three-year program of study for talented individuals seeking advanced training in directing, screenwriting, producing, cinematography, editing and motion picture sound with a solid background in film history, theory, and criticism. The MFA is a terminal degree and is designed for students who wish to work as independent film artists, enter the film industry, or teach at the college or university level. The Master of Arts (M.A.) in Film Studies is a two-year program in film history, analysis, and theory designed to prepare students for further study at the doctoral level or for careers in which a film studies background may be relevant, including film criticism; arts-related writing fields; administration of arts, museum, or academic programs; administrative positions in film or media production; and library, archive, or film preservation work. Coursework includes a two-semester sequence in film history and a range of electives on film theory and criticism, film genres, and, in particular, international cinemas. The Kennedy Museum of Art, named to honor Edwin L. and Ruth E. Kennedy, is housed at the Ridges in historic Lin Hall. Its collections include southwest Native American textiles, jewelry, and a contemporary collection of prints. The museum offers a wide array of exhibitions, a line-up of educational offerings, tours, and more. College of Health Sciences and Professions was originally launched in 1979 as the College of Health and Human Services, and was restructured in 2010. The School of Recreation and Sport Sciences offers an array of academic programs at the graduate and undergraduate levels. The Sport Management Program is one of approximately thirty such programs in the country to have won program approval by the Sport Management Program Review Council (SMPRC). Programs of study in the School emphasize an accommodating learning atmosphere that promotes high academic standards and a commitment to encouraging an active and healthy lifestyle. The School is dedicated to creating, improving, and propagating theoretical and practical information through its distinct programs. The Honors Tutorial College was established in 1972. The college offers select students the opportunity to pursue a curriculum that incorporates the essential features of the traditional British tutorial system practiced for centuries at Cambridge and Oxford universities. The program generally accepts around 55 students per year from a large application pool. It offers programs in 34 disciplines, from journalism to astrophysics. The college was officially founded in 1972, although an Honors College had existed previously since 1964. The George V. Voinovich School of Leadership and Public Affairs, named after alumnus and former Ohio Governor and Senator George Voinovich, is built around critical multidisciplinary programs that are primarily engaged in applied service or research in or into the region. The school is built around three areas: (i) Entrepreneurship and Regional Development, (ii) Policy Innovation and Strategic Leadership, and (iii) Energy and the Environment. In each area, students, faculty, and professional staff participate in a model of multidisciplinary education, blending rigorous classroom instruction and scholarship with applied service to the region, state, and nation. Collaborative partnerships with other Ohio colleges, Regional Higher Education, and business and government entities in Southeast Ohio and the state are also critical to the school. The Global Leadership Center offers a two-year undergraduate program in global leadership and accepts high-achieving applicants from any degree program on campus. The program offers students the opportunity to pursue a curriculum that incorporates the features of the traditional classroom setting with real world, global directives and communication. The GLC has recently been affiliated with Bangkok University, several United State Embassies abroad, the UNDP Liberia, Harvard University, Marriott International and numerous other government, NGO, and private organizations around the world. In 2009, the Center was recognized at the United Nations as one of the country's premier International programs. Omicron Delta Kappa, the national and international leadership honorary, serves as the organization which recognizes student leaders who have contributed to the life and student body at Ohio University. The university is well known in Malaysia for its ties with MARA University of Technology from the 1980s. The Heritage College of Osteopathic Medicine was established in 1975. It is currently the only osteopathic medical college in the state, and offers the degree Doctor of Osteopathic Medicine (D.O.). The college is accredited by the American Osteopathic Association. In 1993, Barbara Ross-Lee, D.O., was appointed to the position of dean of the Heritage College of Osteopathic Medicine; she was the first African-American woman to serve as the dean of a U.S. medical school. As of the 2011-2012 academic year, there were 493 students enrolled. In 2012, the college established agreements to build two new medical school extension campuses. Through a partnership with OhioHealth, a class of 50 OU-HCOM students will begin training in Dublin, Ohio, by August 2014. In Cleveland, Ohio, the Cleveland Clinic and OU-HCOM plan to train 32 students by July, 2015, at the Clinic's South Pointe Hospital. The Graduate College is the college for graduate students at Ohio. The college includes over thirty areas of post-baccalaureate concentrations, and awards M.A. M.S. and Ph.D. degrees. The Heritage College of Osteopathic Medicine sponsors the Institute for Neuromusculoskeletal Research; Tropical Disease Institute; Edison Biotechnology Institute; and Appalachian Rural Health Institute. In Engineering and Technology, Ohio sponsors: The Institute for Sustainable Energy and the Environment; The Center for Advanced Materials Processing; The Center for Advanced Software Systems Integration; The Automatic Identification Education and Research Center; The Avionics Engineering Research Center; The Institute for Corrosion & Multiphase Technology; The Center for Intelligent, Distributed and Dependable Systems; The Ohio Research Institute for Transportation and the Environment; and, The T. Richard and Eleanora K. Robe Leadership Institute. The Institute for Applied and Professional Ethics; The Charles J. Ping Institute for the Teaching of the Humanities; Institute for the Empirical Study of Language; The University's Business Incubator, The Innovation Center; and, The Nanoscale and Quantum Phenomena Institute. The College of Arts and Sciences sponsors: The African American Research and Service Institute; The Astrophysical Institute; The Contemporary History Institute; The George V. Voinovich Center for Leadership and Public Affairs; The Center for Intelligent Chemical Instrumentation; The Institute of Nuclear and Particle Physics; The Ohio University Cartographic Center; The Institute for Quantitative Biology; and, The Center for Ring Theory and Its Applications. The School of Business sponsors: The Center for eBusiness; The Center for International Business Education and Development; The Ohio University Insurance Institute; and, The Sales Center. In Communications disciplines, Ohio sponsors: The Institute for International Journalism; The Scripps Survey Research Center; The Telecommunications Center; and, The Institute for Telecommunication Studies. In Education, Ohio sponsors: The Center for Cooperative Curriculum Development and Partnerships; The Institute for Democracy in Education; The George Hill Center for Counseling & Research; The Center for Higher Education; and, The Center for the Study and Development of Literacy and Language. In Health and Human Services, Ohio sponsors: The Child Development Center and The Center for Sports Administration. The Center for International Studies was established in 1964. In Game Research and Immersive Design, Ohio sponsors the GRID Lab, an initiative of its Scripps College of Communication, providing Ohioans the training, education, and opportunity to develop technical and creative skills with digital game technology. The GRID Lab serves as an innovative and creative center for undergraduate and graduate students, faculty, and staff research and project development. It was founded by various faculty and staff from the School of Media Arts and Studies. The current director is John Bowditch. University College was established in 2004. The college comprises students seeking to design a major program of study for their baccalaureate degree, and faculty from various disciplines. Ohio's mascot is Rufus the Bobcat, and a life-sized sculpture of a bobcat commissioned stands poised at the entrance to Peden Stadium. The mascot name "Rufus" was selected as the result of a campus-wide election, after an alumnus, Michael A Massa, made the suggestion to the university. The Bobcats football team plays in the 24,000 capacity Peden Stadium; the 13,080 seat Convocation Center serves as home to the university's men's and women's basketball and women's volleyball teams. All university sporting events are open to students at no charge. Ohio's men's and women's athletics teams compete under the official colors of hunter green and white. University sports, called Ohio in competition, began in 1894 with an 8–0 loss to Marietta College in football. The university is a charter member of the NCAA Division I Mid-American Conference, established in 1946, and remains the sole charter member competing in the conference. University intercollegiate athletics include six men's squads and eight women's squads and range from individual athletics to team sports. Most recently, Ohio University defeated 4th seeded Michigan in the 2012 NCAA basketball Tournament. They followed up that 2012 victory over the Wolverines with a 62–56 win over 12th seeded South Florida, reaching the Sweet Sixteen for the first time since 1964. 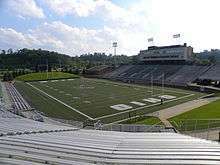 Peden Stadium, the oldest football venue in the Mid-American Conference, is a designated state historical site. The 13,080-seat Convocation Center is Ohio's basketball, volleyball, and Wrestling venue. Varsity Ohio serves as the alumni organization which recognizes former Ohio student athletes. The are 36 active club sports programs at Ohio, run out of the Department of Campus Recreation. Club sports include sports for both genders, including co-ed sports. Teams are assigned to instructional, white, green, or red tier depending on the number of members of the team, dues collecting, funds raised, and community service hours completed. The higher tier the sport is in, the more money that the team receives from the school and also the higher priority that team gets. The Ohio University Fencing Club is a club with four scoring machines and fencers of all weapons. Students operate a newspaper, television, and radio stations at Ohio University. The main newspaper, The Post, publishes in print five days a week and online all days of the week, while the university is in session and is officially independent of the university and its administration. Ohio University Public Television is a PBS affiliate broadcasting on WOUB Athens/WOUC Cambridge. In addition to national PBS programs, WOUB features Newswatch, a nightly news broadcast with student reporters. Other student produced programs include "Gridiron Glory" (following the Southeastern Ohio and parts of West Virginia high school football season, the recipient of many Emmys) and "Bobcat Blitz" (following Ohio Bobcats during the year). Wired for Books, an online educational project of the WOUB Center for Public Media, has received several awards. WOUB-FM 91.3 Athens, WOUC-FM 89.1 Cambridge, WOUH-FM 91.9 Chillicothe, WOUL-FM 89.1 Ironton, and WOUZ-FM 90.1 Zanesville broadcast the same programs throughout southeastern Ohio. Separate public radio programming is also heard in Athens on WOUB AM 1340. ACRN ("The Rock Lobster"), founded in 1971, is an Internet radio-only station and the university's only student-run radio station. The university also publishes Compass, the institution's official online news and information resource. Students maintain a variety of organized and independent service events. The Community Service Leadership Council involves students to oversee a Project of the Week every Saturday. The projects have included work with Good Earth Farms, Last Chance Corral, Cadillac Ranch, Habitat for Humanity, Alpha Delta Pi, Alpha Phi Omega, Pi Beta Phi, Project C, Rotaract, the Survivor Advocacy Program, and the Thursday Supper Volunteer Corps, among others. Charities at Ohio University have involved flag football tournaments and the 5K Flour Run, and have benefited O'Bleness Health System's Women's Health Fund and the Athens Backpack Program, respectively. Student Senate's Beautification Day regularly receives a large turnout and is particularly unique in the Spring. In early 1962, President Vernon Alden signed the first of several contracts with the federal government to facilitate Peace Corps volunteer training programs. Today, Ohio University hosts a recruiting office for the Peace Corps in a tradition affiliated with that organization since Sargent Shriver's visit. * Edwin Watts Chubb was acting president for one year in 1920 when President Ellis died and again in 1934 when President Bryan died. Except for Super, Crook, and current president McDavis, all presidents of the university have buildings named after them, most notably Ping Recreation Center, Baker University Center and Alden Library. The remaining buildings are residence halls and administrative buildings. ↑ "NCSE Public Tables Endowment Market Values FY 2013". February 3, 2014. Archived from the original (PDF) on May 18, 2014. Retrieved 2014-05-30. ↑ "Colors, One Voice: Brand Standards for Ohio University". Ohio University. Retrieved 10 October 2014. ↑ Act of February 18, 1804, 2 v. L.O. p. 193. Printed in full in A compilation of laws, treaties, resolutions, and ordinances: of the general and state governments, which relate to lands in the state of Ohio; including the laws adopted by the governor and judges; the laws of the territorial legislature; and the laws of this state, to the years 1815–16. G. Nashee, State Printer. 1825. pp. 226–232. ↑ Burke, Thomas Aquinas (September 1996). Ohio Lands: A Short History (8th ed.). Ohio Auditor of State. Retyped & graphics rescanned by Stewart-Zimmerman, Maggie (December 1997). "Ohio Lands - A Short History". Retrieved March 27, 2011. ↑ "Enrollment Statistics: Fall 2014" (PDF). Athens, Ohio: Ohio University. 2015-02-18. pp. 4–5. Retrieved 2015-04-28. ↑ "Freshmen: Ohio University Admissions". Retrieved July 12, 2015. ↑ "Freshman Guidelines". Retrieved July 12, 2015. ↑ "OU-HCOM - Office of Admissions". Retrieved July 12, 2015. ↑ "OHIO Majors - Undergraduate - Overview". Retrieved July 12, 2015. ↑ "Degree Programs". Retrieved July 12, 2015. ↑ "OHIO: EVPP - Accreditation of Ohio University". Retrieved July 12, 2015. ↑ "Carnegie Classifications - Institution Profile". Retrieved July 12, 2015. ↑ "Official Site of The Mid-American Conference". Archived from the original on October 10, 2011. Retrieved July 12, 2015. ↑ "NCAA Basketball Tournament History". ESPN.com. Retrieved July 12, 2015. ↑ "Ohio University". Ohio History Central: An Online Encyclopedia of Ohio History. Retrieved February 22, 2015. ↑ Ari Arthur Hoogenboom (1988). The Presidency of Rutherford B. Hayes, p. 10. University Press of Kansas (original from University of California). ISBN 0-7006-0338-7. ↑ "Ohio University: Athens County, Ohio". Athens County. 2013. Retrieved 2 February 2013. ↑ "History and Traditions of Ohio University". Ohio University. 2013. Retrieved 2 February 2013. ↑ "College Green landmark was a magnet for lovers". The Athens News. 13 December 2010. Retrieved 2 February 2013. ↑ "College Green of Ohio University". Ohio University. 2013. Retrieved 2 February 2013. ↑ "Ohio University Virtual Tour". Ohio University, www.ohio.edu. 2013. Retrieved 2 February 2013. ↑ "Ohio University Libraries Archives". Ohio University. 2013. Retrieved 2 February 2013. ↑ "East Green of Ohio University". Ohio University. 2013. Retrieved 2 February 2013. ↑ "South Green of Ohio University". Ohio University. 2013. Retrieved 2 February 2013. ↑ "West Green of Ohio University". Ohio University. 2013. Retrieved 2 February 2013. ↑ "OHIO: Compass - Fortune Magazine ranks OHIO Professional MBA program third 'Best Value'". Ohio University. ↑ "OU Is Number 124 In US News Annual College Rankings - WOUB Digital". WOUB Digital. ↑ "Ohio University Outlook". ohio.edu. ↑ David Lariviere. "Ohio University". Forbes. 1 2 "Ohio University". OhioHigherEd. 2013. Retrieved 7 January 2013. ↑ "Top Producers of U.S. Fulbright Students by Type of Institution, 2011-12". The Chronicle of Higher Education. ↑ "OHIO: Compass - University named a top producer of U.S. Fulbright Students". Ohio University. ↑ The Values of Ohio. http://www.ohio.edu/5c/ Retrieved 26 June 2012. ↑ Ohio University Outlook: Making the vision reality, February 6, 2009. ↑ Ohio University Outlook: Nine Ohio University students win Fulbright Awards, May 24, 2005. ↑ Ohio University Outlook: Nine Ohio University students awarded Fulbrights, June 28, 2004. ↑ "Best Colleges - Ohio University". U.S. News & World Report, LP. Retrieved 21 January 2015. ↑ "The Sales Centre at Ohio University - About Us - Welcome". Aspnet.cob.ohio.edu. Retrieved 2012-10-03. ↑ "Inactive Content". Ohio.edu. 2012-04-03. Retrieved 2012-10-03. ↑ "E.W. Scripps School of Journalism". Scrippsjschool.org. Retrieved 2012-10-03. ↑ "College Annual Report". Cehs.ohio.edu. Retrieved 2011-10-06. ↑ "Welcome to The Gladys W. and David H. Patton College of Education and Human Services @ Ohio University". Cehs.ohio.edu. 2010-07-01. Retrieved 2011-10-06. ↑ "University gift grows by more than $10 million". 2008-06-25. ↑ "Honors Tutorial College". ohio.edu/honors. Retrieved 2013-12-02. ↑ "Global Leadership Center Home". Ohio.edu. 2012-04-03. Retrieved 2012-10-03. ↑ Erin Roberts (January 26, 2009). "Kudos go to GLC international partnership". Outlook – Ohio University News & Information. Ohio University. Retrieved February 9, 2009. ↑ "OU-HCOM - Our College". Oucom.ohiou.edu. Retrieved 2012-10-03. ↑ "Ohio University Heritage College of Osteopathic Medicine" (PDF). American Association of Osteopathic Colleges. Retrieved May 17, 2012. ↑ "Dr. Barbara Ross-Lee". National Library of Medicine. Retrieved May 17, 2012. ↑ "It's official: Dublin is the site of new Ohio University medical school extension campus". July 17, 2012. Retrieved October 2, 2012. ↑ Bethany Venable (June 11, 2012). "OU-HCOM, Cleveland Clinic Announce Extension Campus". WOUB. Retrieved October 2, 2012. ↑ "Center for International Studies". Internationalstudies.ohio.edu. Retrieved 2012-10-03. ↑ "John Bowditch | Ohio University School of Media Arts & Studies". Mediaschool.ohio.edu. 2011-08-01. Retrieved 2012-10-03. ↑ "University College". Ohio.edu. 2012-04-03. Retrieved 2012-10-03. ↑ "Ohio University Athletics Ticket Policy". ↑ "OHIO: Club Sports | Welcome to Club Sports". Ohio.edu. 2010-07-08. Retrieved 2011-10-06. ↑ "OHIO: Campus Recreation | Welcome to Campus Recreation". Ohio.edu. 2010-07-08. Retrieved 2011-10-06. ↑ "OUFC - Home". ohio.edu. ↑ "The Rock Lobster". ACRN. 1971-04-04. Retrieved 2011-10-06. ↑ "Ohio University Campus Life". Ohio University. 2013. Retrieved 2 February 2013. 1 2 3 Ohio University 1804–2004: Spirit of a Singular Place. Betty Hollow. 2004. Wikimedia Commons has media related to Ohio University. "Ohio, University of". Collier's New Encyclopedia. 1921.